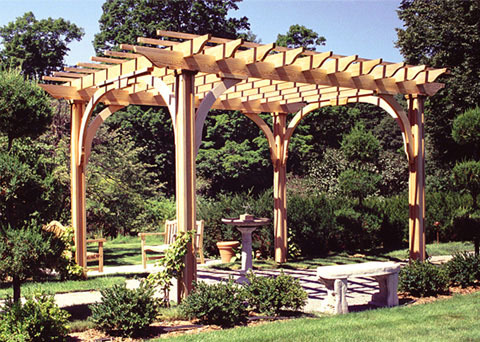 This pergola has a traditional keystoned arch connecting the posts and supporting the end rafters. The four brackets are perfectly symmetrical with the arches and support the main beams. The sizes of the beams and rafters depend upon the span requirements, which is often dictated by the number of posts desired. This example shows a type of paneled post. The 2 x 2 purlins complete the structure and their density can be increased for added shade. 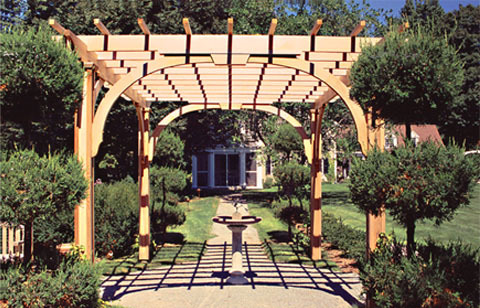 While the pricing for The Keystoned Arch Pergola varies as to size and span requirements, generally the cost for this structure is between $45 and $55 per square foot. Specifics that affect the price are density of overhead structure, span distance of main beams and type of attachment to the foundations. Several variables will need to be discussed with you in order to price your Keystoned Arch Pergola. We will be happy to guide you through these questions. Please call 888-285-4624 with your size requirements and we will be able to quote a price for The Keystoned Arch Pergola.